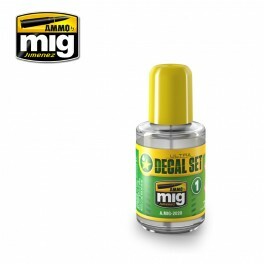 This easy to use solution is as simple as moistening the surface and then placing the decal onto the surface previously gloss-coated in preparation for the decals. ULTRA-DECAL SET and dries within minutes, allowing you to continue modelling with the decals fixed in place . We recommend using ULTRA-DECAL FIX solution next and then adding a second coat of gloss varnish on top.